Some people will do anything for fun, and Yves "Jet Man" Rossy is a prime example. Crazy! But it sure looks like fun. There's a bigger Flash-player version here. It was reported yesterday that Hubble's primary (ACS) camera has failed, leaving the space telescope only partly operational until a workaround can be found. A real fix will await the 2008 shuttle servicing mission, which may extend HST's working lifetime to around the expected 2013 launch of the James Webb Space Telescope (JWST), formerly called the NGST (next generation space telescope). 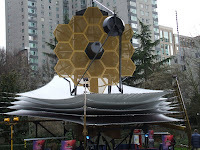 The picture shows a full-size JWST model on display at the recent AAS meeting in Seattle. JWST is quite cool, and it will make use of some really advanced optics, materials, and other technology. One interesting application is the use of an array of micrometer scale "shutters" directly in front of the detector array of ESA's Near Infrared Spectrograph (NIRSpec), allowing scientists to selectively block out bright objects in the field of view to improve the instrument's sensitivity for fainter objects. Technology Review has a nice article on this MEMS-based technology here. I'm hoping someone will build an add-on model of the JWST for Orbiter one of these days. There are some interesting orbital mechanics related to its planned orbit at the L2 Lagrange point that I'd like to try out (of course I could use any spacecraft in Orbiter to play with the orbit). In the meantime, if you'd like your own 3D model, you can download the parts and instructions for a paper model. The rovers Spirit and Opportunity celebrated three years on Mars this month - regular little Energizer Bunnies who just keep roving and roving and roving. Amazing engineering and amazing science, and they're cute little robot guys too. If you haven't read Roving Mars by Steve Squyres, I highly recommend it. 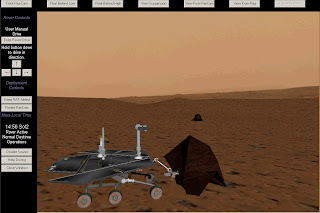 While looking for something related to the Moon, I happened to find this free on-line Drive on Mars simulation that like the rovers themselves, is still active three years later. It lets you drive the rovers around fairly realistic simulations of the two landing sites. It is based on an ActiveX plug-in and runs in a web browser window. On a quick test drive of Spirit, it seemed that sundown arrived awfully fast, until I noticed that time is accelerated about 60x (about one second per minute of real time), presumably because the rovers move so slowly (about 50 mm/second top speed, about 0.2 km/hour) that driving them in real time would be painfully slow. The solar powered rovers are inactive at night, but sunrise also comes around quite fast at 60x, so no worries. You can drive manually with arrow buttons, or double click a spot of terrain to plant a red target flag and let the rover navigate itself there. There are also buttons for several different views, including the cool undercarriage view that shows how the six wheels make turns and roll over bumps. It's not exactly Grand Theft Auto (which my daughter reminds me is not really much about driving), but it's kinda fun. As if I needed an excuse, planning for space-related educational outreach programs is prompting me to expand my personal library of books and DVD's. 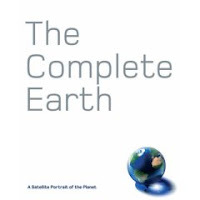 A recent example: a giant format book called The Complete Earth that I bought at Borders for $20. This 2006 book is essentially a photographic atlas of the entire Earth based on NASA's Blue Marble: Next Generation project, imagery created from MODIS observations at a resolution of 500 meters per pixel. While this imagery is available on line, having it an oversize book format emphasizes the size of the Earth and the detail now available in an easily browsable format. I also discovered that I have The Science Channel (a spinoff of the Discovery Channel) on cable TV, and since I recently bought a DVD recorder, I've started to collect some of their space related programming for reference and educational use. Just this weekend I recorded and watched parts of three recent one-hour shows on Jupiter, Pluto, and Mars. 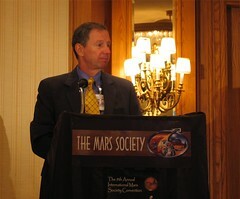 Revealing Mars is from 2006 and mainly discusses Mars Reconaissance Orbiter (MRO). This excellent show airs again in February, but the Pluto and Jupiter shows are not listed for further broadcasts at the moment. One of the great things you can do in Orbiter is install one of the Apollo add-ons, spend quite a bit of time learning the ropes, and then experience for yourself some of the wonder of those amazing missions (there are two add-ons now, NASSP and AMSO). 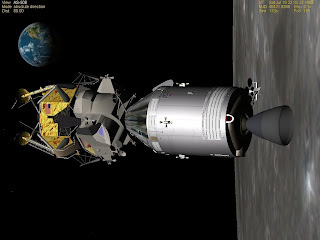 I've played with NASSP and flown a number of specific scenarios, including launching the Saturn V to Earth parking orbit, docking with the LM en route to the Moon, entering lunar orbit (picture above), and finally landing on the Moon. But so far I've never done an end-to-end, Earth launch to Moon landing to Earth re-entry simulation of a complete Apollo mission. It's amazing that you can do this in Orbiter, and someday I will. In the meantime, I like the extensive sequence of screen shots from a complete Apollo 11 mission (NASSP, with all the switches in the CM and LM) recently flown by Martin Hunter and posted in this flight simulator forum. Postcards from virtual space - nice job! Of course I wasn't really doing anything about my disorganization other than feeling guilty, but now that Time tells me that messy is the new neat, I can even lose the guilt! This is the message of a brand new book (A Perfect Mess: The Hidden Benefits of Disorder--How Crammed Closets, Cluttered Offices, and On-the-Fly Planning Make the World a Better Place) that I may have to buy and add to one of my various piles of books to read sometime. I've always liked Randy Newman, and I really like the lyrics to his song "A Few Words in Defense of Our Country." As the New York Times says, it's "another take" on the state of the Union. Although it's only a song, it's got a much firmer grip on reality than the President does. Fly (your name) To Mars! 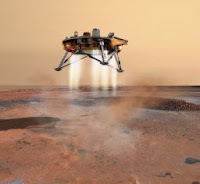 Whether future Martians will actually view it or not, I don't know, but you can add your name to a special long-life DVD that will land on Mars on the Phoenix spacecraft in May 2008 (launching this August). If you're a member of the Planetary Society, your name is probably already on the list, but if not, you can send your name to Mars by filling out this simple web form. It's free! And you will also get to print out a nifty certificate. Will it change your life to have your name flown to Mars on a special DVD? Maybe not, but consider this: there will be billions and billions of people whose names are not on that DVD on Mars. Your name will be. So there. I visited the New England Air Museum in Windsor Locks, Connecticut on Saturday with fellow members of the Aldrich Astronomical Society. After a guided tour of the aircraft areas (including an original and still operable engine built by the Wright Brothers in 1910, and a beautifully restored B-29), we had a special presentation by "Dr. Flush," the "stage name" of Mr. Donald Rethke. Starting in 1963, Don spent more than 40 years at nearby Hamilton Standard (now Hamilton Sundstrand), working on space life support systems, including the environmental systems for the Lunar Module and the Apollo space suits. More recently he was involved in developing the special toilets used in the shuttle and the ISS, resulting in the colorful nickname he uses in his educational presentations. 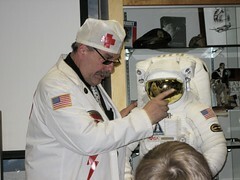 In spite of a power failure that required him to do his presentation under emergency lights and flashlights, Don gave a fascinating overview of the challenges of "life after liftoff" and also displayed and discussed some real hardware, including the "guts" of the Apollo LM life support system and space suit "backpack." These were systems that simply had to work, and of course they did very well. He also brought a reduced scale mockup of the EVA spacesuit currently used by shuttle and ISS astronauts (see picture above). The design of a toilet for use in zero-G was also a challenge. It could not use any water (making the moniker "Dr. Flush" somewhat of a misnomer in this application), and it had to be reliable, easy to clean, odor free, and much more. For a (fully clothed!) video demonstration, check out this NASA page. My father-in-law, Charlie Cook, passed away yesterday. He was 87. 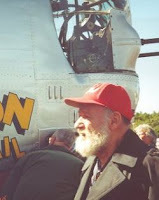 After serving four years as a military pilot in World War II, he went back to school for a master's degree from Clark University and then worked for many years as a psychologist, working for the state of New Hampshire and later in private practice. I interviewed Charlie in 2000 and wrote an article on his flying career, which you can find at MiGMan's Flight Simulation Museum. I also wrote about Charlie and my own father in a Veteran's Day post in November 2005. The war left emotional scars that Charlie struggled with all his life, but like so many others of his generation, he didn't think he had done anything out of the ordinary and he didn't ask for any special attention or credit. Charlie had a quick mind and always enjoyed learning - I found a college lecture on Einstein and relativity in his DVD player yesterday when we stopped by his house to check on things. He was a good man and we will miss him. On a brighter note than that last post, I really like this essay by NASA Administrator Mike Griffin. Why explore space? Read this brief, pragmatic, but future-oriented opinion piece by the man charged with using the limited resources NASA is given to execute the Vision for Space Exploration. You may not agree with all his decisions and priorities, but as he pointed out when I heard him speak last summer at the Mars Society Conference, he is the policy administrator, not the policy maker. It's a tough job, and while I wish NASA would provide more support to private space developments, they have to keep a lot of balls in the air (and spacecraft in space), and I believe that Griffin's heart and mind are in the right place, and that his eyes are focused on our future as a spacefaring civilization. I still like Mike. Can't we all just get along? A quick look around the world shows that the answer is "not anytime soon." The recent Chinese test of an antisatellite (ASAT) weapon suggests that we won't all be getting along in space either. Of course the U.S. and Russia are known to have ASAT technology, though neither has tested anything in space since the mid-nineteen eighties. The Chinese launched what was believed to be a kinetic energy weapon (i.e., a projectile that kills the satellite by flying into it at high speed) to destroy one of their own older weather satellites, resulting in a cloud of space debris estimated at 800 objects. What a mess. And that goes for the whole "war in space" thing too. It would be nice if space could be all about peaceful international cooperation. It should be all about peaceful international cooperation - that would be best for everyone. But space is also a valuable resource and a strategic high ground, and international powers are bound to jockey for position there, as President Bush made clear last fall when he signed the new National Space Policy that declared that "freedom of action in space is as important to the United States as air power and sea power." Actions speak louder than words, so I guess it's natural for the Chinese to want to assert their position too. Not good, but natural. I hope it leads to serious discussions about ways to limit weapons in space, but I'm not too optimistic. Clouds, trees, and laziness caused me to miss seeing Comet McNaught this past two weeks when it was visible in the northern hemisphere (SpaceWeather.com and this photo gallery reminded me of this sad fact). I wondered if I could simulate a comet in Orbiter (not that this is a good substitute or anything). Well I did, sort of. I borrowed part of an add-on by Brian Jones, simulating the ESA Rosetta mission (search for rosetta2.zip on Avsim.com). I then played around for a few minutes editing scenario files to place the comet near Earth so it would be visible near sunset at Cape Canaveral. 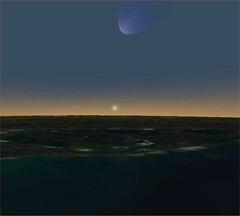 The resulting picture is not very convincing, I admit (it's definitely not McNaught). I was surprised that there are very few Orbiter add-ons that simulate comets and asteroids. There are some, but the focus is on simulating the spacecraft and the flight for missions such as Rosetta and NEAR that have visited such bodies, and the developer typically includes the comet or asteroid as part of the add-on. See Flickr for more. I stumbled upon another piece of astronomy-related freeware, the Digital Universe Atlas from the Hayden Planetarium in New York. 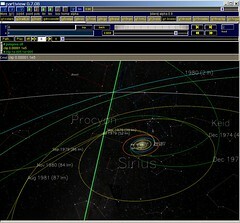 It consists of a number of astronomy databases, starting with the Milky Way, and it includes a program called Partiview to display and let you graphically "fly" through the data. Partiview was apparently designed as a general purpose data display and exploration tool, and its GUI is suitably powerful and general (and cryptic). My first impression from an hour of play last night is that it has promise for helping to understand the truly gigantic scale and 3D structure of our Galaxy (other databases even let you go beyond the Milky Way). It's rather cool to see the stars flying by with a real feeling of 3D, but the interface is a hard nut to crack (the documentation reads like a Unix manual - they need someone to write a "Go Play In Data"). The Hayden downloads (60 to 72 MB) include Partiview, various databases, and some student exercises. I'll toy with this a bit more sometime, but I'll probably end up poking around our tiny Solar System most of the time in Orbiter, or looking at the sky from our familiar Earthbound perspective in Stellarium. I might have another look at Celestia - it goes beyond the Solar System too. I thought its interface was tough when I tried it, but having seen Partiview, maybe it will seem friendlier! At least it's purpose-built for astronomy. I've been doing my usual trick of reading three or four books at once, including an SF bargain-table buy, Old Twentieth (2005) by the usually reliable Joe Haldeman. It started out strong but the ending just didn't work for me - it seemed like he was rushing to wrap it up and it was pretty unsatisfying. Oh well - it was quick and had some good moments. But I'm still loving Seeing in the Dark: How Amateur Astronomers Are Discovering the Wonders of the Universe by Timothy Ferris. In between his main subjects, Ferris briefly profiles a number of individual amateurs, and I decided to seek out some CCD images by one of them, Florida based Don Parker. His shots of Mars and Jupiter taken with an old (but optically fine) 16 inch Newtonian are really incredible. 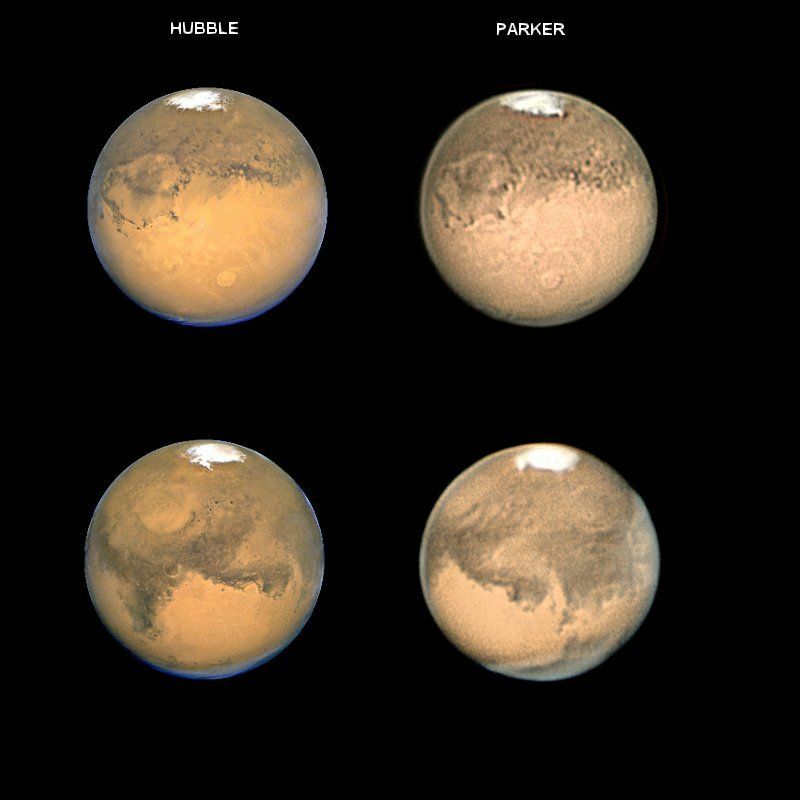 You can see a few of them on this page, including the one shown here, which compares images of Mars taken by Don and the Hubble Space Telescope. Pretty impressive! With HST, large professional telescopes, and probes orbiting Mars and Saturn, you might think that everything important in the sky is covered. But that's far from true. HST and large ground-based scopes are heavily scheduled, and orbiting probes can see selected details but may miss the big picture or an unexpected development. Serious amateurs continue to make important contributions, often through repeated observations. Communication satellites and some weather satellites are placed in geostationary orbits, meaning that they remain above a particular point on the Earth's surface as the Earth rotates and the satellite orbits at exactly the same rate. Orbiter includes a number of sample scenarios to demonstrate various program features. One of them is called Geostationary orbit, which features the futuristic "Delta Glider" (DG) spacecraft that is used for training and other purposes in Orbiter. Here's how to use it to demonstrate the key points of such orbits. See the first post in this series if you need help downloading, installing, and starting Orbiter. 1. Start Orbiter, and in the Orbiter Launchpad, click on the Modules tab, and check to see if ExtMFD is listed under "Active modules." If not, select it in the right side list, and click "Activate selected." This module lets you display Orbiter instruments in separate windows. 2. Still in the Orbiter Launchpad, double click the Navigation folder, then the Special orbits folder, and then the scenario Geostationary orbit. When Orbiter runs, you'll be in the 2D cockpit view. Press [F1] to toggle to the external view. You will see the DG but you won't see the Earth yet. 3. Press [F4] to open the main menu, click Camera... and then click the Track button. In the list at the bottom, choose Earth, then click Target to... (this will keep both the DG and Earth in view). Press Z a couple of times to magnify the view, and zoom out a bit with the mouse wheel so you can see most of the Earth behind the DG. You should also click Time warp... to open the Time acceleration control. 4. Click the Custom... button on the menu, choose External MFD, and click OK. Drag the new "Orbit: Earth" window to one corner. Click Custom... again and make a new External MFD. On this one, press the [SEL] button at the bottom, then click the [Map] button on the left. Repeat this for a third external MFD, and this time press [SEL] followed by [Surface]. Drag the MFD's to the corners as shown. 5. Note the date and time of day in the upper right corner - it should be Thursday, 22 September 2005 at around 07:25. Speed up time to 1000x and watch the instruments and the view of the Earth change. When Earth gets dark, click the 1x (normal) time button. Note that because the camera has been set to look at the spacecraft in the direction of Earth, both the orbiting spacecraft and the rotating Earth will appear to be fixed, while the stars and the Sun move in the background (just like our situation when we stand on the rotating Earth and the stars and Sun appear to rise and set). Several other things to notice: on the left side of the blue and tan Surface MFD, there's a number labeled GS (ground speed, m/s). It should be close to zero. Click the [OS] button (orbital speed). It should be about 3000 meters/second, and you will notice that the green orbit position line on the Orbit MFD is sweeping around counterclockwise, but that your surface position (+ sign) on the Map MFD stays fixed over Eastern Africa. If you speed up time to 1000x again, you can quickly reach 07:25 on Friday, 24 hours after you started. The spacecraft has traveled all the way around its orbit, but the Earth rotated at the same rate, so the DG remains "fixed" above eastern Africa all the way. How would this be useful for communication? For weather sats? Orbiter is completely metric, so when I was writing yesterday's post about force vector visualization, I wanted to mention the conversion from meganewtons (MN) to pounds-force (lbf) for those more familiar with "English units" (i.e., pounds of thrust for rocket engines). There are probably a billion web sites with information on converting units, but I especially like AllConversions.com, because it has a simple format and includes a huge number of units in its drop-down lists. Orbiter for Educators: View the Force, Luke! Forces are fundamental in physics, and while you can feel some of them (like the force of gravity holding you in your seat), you usually can't see them. Except in Orbiter, which can display colorful vectors to show the forces that are acting on any spacecraft, updated in real time. It's pretty cool. Here's a quick way to demo this, using the flight recording of a launch of the space shuttle Atlantis. I assume you've installed Orbiter and know how to find and launch a scenario (if not, refer to the first post in this series or see Go Play In Space). 1. Start Orbiter, open the folder Playback, and double click the scenario Atlantis Launch. 3. Click the Forces tab and check the box labeled Body force vectors. Also check the Total box so you can see the "resultant vector" (net result of all forces). Adjust the Scale and Opacity sliders as desired. 4. Press Control-I (info) to display information about the selected object (by default, the shuttle), including its mass and altitude. As Atlantis launches and climbs to orbit, you'll see a big blue vector representing the thrust (T) , a yellow G vector (represents force of gravity, i.e., weight), a smaller red vector for drag (D), and a white "total force" vector (F). You may also see a smaller set of vectors representing the forces on the payload inside the shuttle's payload bay. The force vectors are labeled with values in MN (mega-Newtons - 1 MN is about 225,000 pounds of force). Watch as these vectors change size and value as fuel is burned (reducing mass), the atmosphere gets thinner, and the shuttle changes orientation. 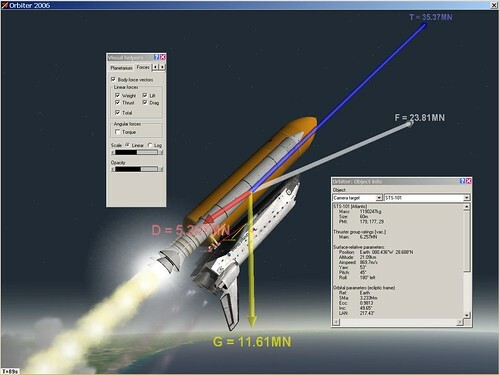 Notice that thrust is greater than the sum of weight and drag, as it must be if the shuttle is to climb and accelerate. Note that drag increases for a while (due to increasing speed) and then falls off (due to thinner air at higher altitude). When the solid rocket boosters (SRB's) separate at about 2 minutes into the flight, they will have their own force vectors, and the thrust and weight values of the shuttle itself will decrease (no more SRB thrust, and mass is also reduced). When the shuttle reaches about 153 km altitude, main engines will shut down and the external tank will separate (though the shuttle would really roll upright before separation from the ET). At this point, both the shuttle and the ET will be in orbit, and the only force visible will be "G" or weight. Is this correct? Isn't the shuttle "weightless" at this point? Not really. In orbit, the shuttle will be in free fall, pulled toward the center of the Earth by gravity but constantly "falling around" the curved Earth. With nothing to resist its motion and "push back" (like the chair that you feel pushing against you when you sit), the shuttle and its occupants will continue to fall freely and will not feel their weight. While it's often called "zero G," gravity is not zero when you are in orbit. Continuing with the quick stuff you can do with Orbiter, here's how to take a quick tour of the Solar System. Although Orbiter scenarios generally include spacecraft and involve operating them (you can even switch between multiple spacecraft), you also have direct access to Orbiter's camera without bothering to fly anything. Regardless of what any spacecraft may be doing, you can use the Camera dialog box to move the camera to any planet or moon or to any surface base, spacecraft, or space station that is defined in the current scenario. Once there, you can control the field of view and zoom level of the camera, and move it around with the mouse. 1. Start Orbiter and Launch a Scenario - See the January 10 post if you need advice on installing and starting Orbiter (remember to go to the Video tab to set your screen resolution before running a scenario). Although you can tour the Solar System in any scenario, the best one to use is Grand Tour which is found in the folder labeled The Solar System. This scenario has good pre-defined viewpoints for most of the planets and moons of the Solar System. 2. 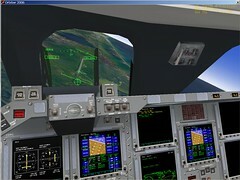 Open the Main Menu - Once you see the 3D view of Earth, press [F4] to display the main menu, then click Camera... to display the Camera dialog. You should also open up the Time Warp dialog so you can easily speed up time to see the rotations of the planets and moons. The Visual Helpers dialog lets you turn various labels on and off (helpful with Jupiter's moons when you are zoomed out and speeded up to see them zipping around the Jovial Giant). You can open these dialogs as needed or leave them open on the screen as Orbiter runs. 3. Tour the Planets - Play with Target and other buttons in the Camera dialog to see what they do, then click the Preset button. Double click any item in the list of presets to go to it. Try clicking the 1000x button on the Time Acceleration (Warp) panel to make the motions more apparent (you can also use the T key to speed up and R to slow down). 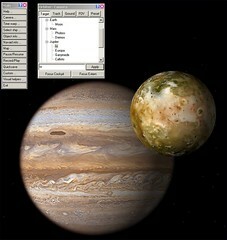 Use the Visual Helpers dialog to turn on Planetarium mode and select various labels and grids. That's it! You can zip around the whole Solar System in about 10 minutes, but be sure to take time to smell the roses (on Earth anyway). Use the mouse (right button) and mouse wheel to change the view and zoom. For more details and ideas for touring, see the second half of chapter 2 in Go Play In Space. I had heard about the Big Red Rocket stunt in the second Jackass movie, but I hadn't seen it until a friend sent me a link to this page with a large-size version of the video shown above. It is amazing in its bold stupidity, but it's also strangely funny to watch this guy cheat death and (just barely) serious injury. I think this is not the way to go play in space (i.e., don't try this at home, kids). This is more like it, and it's good to know that the profits from all those books I've bought from Amazon are contributing to our future in space. Flixxy.com is a pretty cool site - they have picked out some of the best videos on the web. The signal-to-noise ratio is much better than YouTube! There's quite a bit of physics and space stuff along with the usual animal tricks and odd commercials. 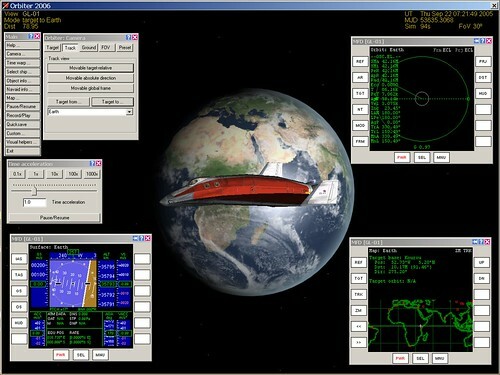 Orbiter is a freeware space flight simulator for the PC that I have written about extensively in this blog and elsewhere. Aside from being a fun way to "Go Play In Space" (the title of a free tutorial ebook I wrote about Orbiter) for people with an interest in space flight, Orbiter also can also be a useful tool for teaching about the solar system, space flight, atmospheric flight, physics, and other subjects. If you're a teacher, you might say, "Great, but when would I have time to learn this thing?" I don't know the answer to that, but the good news is that there are some cool things you can do with very little preparation beyond downloading and installing the software (~20 minutes on a good connection) and following a few instructions. These include giving a cool 3D tour of the Solar System and showing pre-recorded "flight recording" playbacks of the simulated launch and landing of the space shuttle (not just a video - you can control the "camera" and view it from inside or outside the cockpit). This is not quite "no prep," but it's pretty easy. In later installments I will describe things you can do if you can take a little time to learn more about Orbiter. Here are the basics to get you started, which are described in more detail in Go Play In Space (this is a free 9 MB PDF download). 1. Download and install Orbiter - Go to and print the Download page of www.orbitersim.com, where you will find download and installation instructions and a list of "mirror sites" where you can get the actual files. Download the full Base package (63 MB) for Orbiter, and if possible, also download the high-resolution (L10) Earth textures (79 MB) and hi-res "Planets & Moons" (72 MB). These are not strictly necessary but they make the planets look even better (see chapter 1 of Go Play for more details). 2. Download and install Orbiter Sound - This is a separate but nearly essential "add-on" package that is easy to install and adds all sorts of sounds and even music to the otherwise silent Orbiter (sound is easily configurable). Go to Dansteph's download page, download, and run the file Orbiter Sound 3.0 (10.4 MB) to install it (see chapter 1 of Go Play for more details). 3. Start Orbiter and Choose a Playback Scenario - Double clicking the Orbiter icon displays the Launch Pad, where you can pick and run a scenario from one of many folders (go to the Video tab first to set your screen resolution). Double click the Tutorials folder and then the Atlantis Final Approach playback scenario (a very quick playback with on-screen text explanations). Once the playback starts, it will switch to different views automatically. When it first goes to an internal view, press [F8] to switch to the 3D "virtual cockpit" which looks more like the real shuttle cockpit. You can manually toggle between internal and external views with [F1]. 4. Learn the Basic Operations - The main view things are that holding the right button and moving the mouse lets you move the camera around, while the mouse wheel (or PgUp/PgDn) controls camera zoom. The [F4] key displays the main menu. Choose Exit from the menu to quit (or use Control-Q). 5. Watch Atlantis Land - Orbiter is interactive - you can do everything yourself and even take over a playback at any time to fly it yourself - but playbacks are nice for talks because you only have to worry about the views. Another quick tutorial playback is Smack! Rescue (described in chapter 2 of Go Play), and Atlantis Launch, found in the Playback folder. I'll do a "some prep" article soon to talk about touring the Solar System and taking control of an orbiting spacecraft. Later articles will talk about using add-ons to simulate historic space missions , making forces visible, and other subjects. In late 2005, I heard about the JPL Solar System Ambassadors Program, which is a volunteer educational outreach program sponsored by NASA. Its purpose is to bring information about NASA's space exploration projects to local communities, with presentations at schools, museums, star parties, scouting organizations, and the like. It sounded pretty cool to me, and I wanted to sign up, but applications are accepted only in September for the following calendar year, so I missed it for 2006. I applied this past September and was accepted in December for the 2007 calendar year. Tonight I participated in the new ambassador orientation training, a telephone conference supplemented by downloaded PowerPoint presentations. This makes me somewhat official, although there is still an ethics presentation that's required before I can begin to do events on my own. I'm fortunate that there are already three JPL Ambassadors in Central Massachusetts (my bio is on line, but they haven't updated the maps yet), all of whom are also members of the Aldrich Astronomical Society, which I recently joined myself. This means I'll be able to learn the ropes on some shared events before organizing some on my own. I love talking about space and astronomy (ya think? ), so this is a fun thing for me. I've already helped out with a couple of Aldrich club events, one with middle school kids (age ~11) and the other with Cub Scouts (ages 6-10). I talked about the space shuttle (which was up for the Cubs' event) and the Hubble Space Telescope, demonstrating them with the help of Orbiter. I also gave the kids a quick tour of what they would be seeing in the telescopes outside with the help of Stellarium. Kids of these ages are eager to ask and answer questions and they still seem to think this stuff is pretty cool. So do I! If you're in Massachusetts and would like to invite a Solar System Ambassador to give a free presentation about space exploration at your school or other organization, contact me or one of the other Massachusetts ambassadors. You can also check this calendar to see if any SSA events are scheduled in your area, or check the U.S. map and contact an ambassador near you to arrange something. In November 2005, I wrote about ESPACE Magazine, a high-quality French magazine focused primarily on space exploration. Although there are some good astronomy magazines in the US, I mentioned wishing that there was something more like the French ESPACE published here. It looks like there finally is, though it's something of a hybrid that covers both model rocketry and spaceflight (which is really not a bad idea). LAUNCH Magazine was launched in September 2006 with its first bimonthly issue, though I only discovered the magazine today at Borders Bookstore, where I bought the third issue (January/February 2007, pictured). 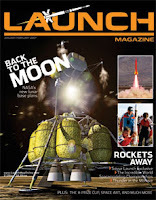 It's nicely produced and has articles on NASA's Moon base plans, space art, the X-Prize Cup, and the Soyuz spacecraft, as well as various articles on model rocketry. This looks like it will be a pretty interesting magazine for space enthusiasts (I can't afford the time to become a model rocket enthusiast, though I wish I could!). There will be television feature on space elevators on the PBS program NOVA ScienceNOW on Tuesday, January 9 (PBS, check local schedule here). Thanks to Brian Dunbar of Space for Commerce (and Liftport) for pointing this out. A video of the segment will be available on-line starting January 10 (a brief video extra hosted by Dr. Neil de Grass Tyson and showing a small Liftport prototype climber in action is on-line now). We're not exactly seeing the T2 scenario yet (it's still a long way from a Roomba to a cybernetic Schwarzenegger), but robot development is advancing and they certainly have been in the news lately, including a cover article by Bill Gates in this month's Scientific American ("A Robot In Every Home"). There have already been a number of robot toys, but one of the coolest has to be Pleo, a baby dinosaur that is in development. I read about it in the current Wired magazine and just found the YouTube video that's posted here. While still quite limited (what would I need one for? ), its motion is pretty life-like, and I especially like the part where he (she? it!) reaches the edge of the table, looks down, stops, and cries! Could the creepy-but-cuddly Teddy from the Spielberg movie AI be far away? Probably. But the present is starting to look a bit more like the future these days. Bring on the flying cars! I'm greatly enjoying Seeing in the Dark by Tim Ferris, and on this unusually warm and rather clear New England evening, I decided I should try a little seeing in the dark myself. Although the waning gibbous Moon, street lights, and the glow of nearby Worcester don't make for especially dark skies, Orion and the Moon itself were attractive enough targets for a little driveway observing. I got OK results with 10x50 binoculars, which gave decent enough views of the Pleiades, the Orion Nebula, the Moon, and a few other objects, but these binoculars are not image stabilized and my arms got tired fast. So I decided to haul out the cheapo telescope I got for my daughter a couple of years ago in a discount store (during her three week burst of interest in astronomy). It's a Tasco 60 mm refractor with a "Starguide" system that I never really got to work. It has a crude plastic focusing mechanism and a shaky tripod, and even with a couple of better eyepieces that I bought to replace the terrible ones it came with, it's really not good for much more than looking at the Moon, just as I remembered. So back to the binoculars. I recently joined an astronomy club and have started to help out with star parties, something I will be doing a lot more of this year. This means that I'm thinking more about the skies and I'm getting to peek through some decent telescopes. I think I can see where this is heading but before I buy a real telescope, I think I better talk to some of my fellow club members who have some experience in this area. The fact that I'm an optical engineer means that I know how to design and simulate telescopes in software, but there's a lot of practical stuff that I don't know that much about when it comes to evaluating the many options and buying something decent (as you can probably tell from the fact that I bought that Tasco, though it was basically a very cheap impulse buy). I didn't do much blogging from or about Australia when we were there on vacation this past summer (winter down there). It's a fabulous place. Tonight I was reading yet another new (used) book that "jumped the queue," Seeing in the Dark by Timothy Ferris (a fabulous science writer). 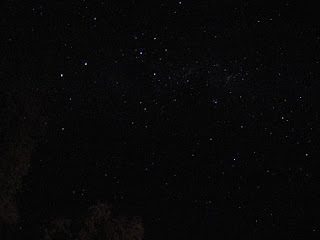 His descriptions of the dark skies of his youth in Florida reminded me of one of the best things we saw in Oz - the southern night sky, including the Southern Cross, Alpha and Beta Centauri, and the Milky Way, set in the velvety-black skies above Jervis Bay National Park, 170 km south of Sydney. We walked on the beach on an especially clear night and the sky was simply dazzling. I didn't have a camera capable of capturing anything like what we saw that night, so I checked on Flickr just now to see if someone else might have captured it. The picture here brought back the memory though it's hard to compare to the visual impression of all those bright stars against all that blackness. This photo was taken by "rplzzz" - check out his description here. There is just so much excellent content on the web for space and astronomy, it's hard to find time to look at all the interesting and useful stuff out there. The good news is that you can always find something that's new to you, even if it's been around for a while. I just discovered a cool blog, What's Up - 365 Days of Skywatching (the archives suggest it started in May 2006). Each day there are great tips for what to look for in the night sky, as well as interesting background information and pictures. 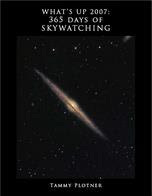 Even better, the author of this blog (Tammy Plotner) has written and collected the observing tips for all of 2007 in a PDF ebook available for free download (it's big, 24 MB). You can also buy a printed copy for $25 from Lulu.com, a pretty good deal for a 410 page book. Orbiter doesn't include any built-in sound features, but thanks to DanSteph, I would guess that few "Orbinauts" ever think of this fact. Dan's OrbiterSound 3.0 has to be downloaded and installed separately (a painless process), but once it's installed, it is so smoothly integrated with Orbiter, that it's hard to imagine that it's "just" an add-on. It is probably the one truly "must have" add-on for Orbiter - it adds immensely to the experience to hear the perfectly synchronized sounds of mechanical systems, thrusters, and engines (only when inside the spacecraft, unless you are in the atmosphere, when external sounds can be heard, growing fainter as you move away from the sound source). Add-on developers can provide custom sounds and "radio chatter," and it even supports MP3 music, providing a cinematic soundtrack when you are in external views (one of many ways to configure OrbiterSound). Dan's other widely-used Orbiter add-on is the cool DeltaGliderIII (a version IV is now in beta), which adds to the challenges of flying the basic DG by making you worry about keeping your passengers alive (don't subject them to super-high G forces, extreme temperatures, or lack of oxygen). Dan also developed the professional Microsoft Flight Simulator add-on FsPassengers (Orbiter seems to be his hobby, luckily for us). Dan's Orbiter Page also hosts a forum (in both English and French) as well as Orbiter-related news items and some feature articles. In addition to all this, he also provides the cool Orbinauts World Map which shows the location and some information about the 612 people who have so far registered as "Orbinauts" (you can find someone called "FlyingSinger" near Boston). 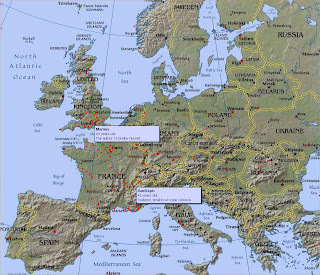 The screen capture here shows Europe, with "DanSteph" and "Martins" (Orbiter's creator) highlighted. Dan has contributed so much to la communauté d'Orbiter - merci, Dan! Band-in-a-Box (BIAB) is an "intelligent automatic accompaniment program" that I first heard about and bought in 2002. I bought it mainly as a tool to help me with songwriting, which I do mostly by creating chord progressions and making up melodies and lyrics to go with them. Usually I do this on a guitar, though I sometimes write with a keyboard, and occasionally with BIAB, especially when I'm traveling without a guitar. BIAB lets you to enter chords by name on a simple grid (A, Bb, F#m7b9, etc. ), set a time signature and tempo, and choose a style. BIAB then automatically generates and plays multiple instrument parts (drums, bass, guitar, strings, etc.) using the PC's sound card (or an attached MIDI device). There are hundreds of styles in the "mega" version I have, and depending on the style chosen, it can generate some pretty cool sounding stuff, which can really help the writing process. Sometimes I've even used the BIAB tracks (exported as MIDI) as the basis of a recording. One example of this is my song "Dedicated & Sincere" which you can preview here (track 10, 2 minute preview). On this song, all the instruments are from BIAB except for the electric guitar lead (that's me). PG Music updates BIAB every year, and I upgrade whenever they offer something that strikes my fancy. The 2007 version arrived yesterday, and the coolest thing for me is the new wizard that can determine the chords from any WAV or MP3 song file! Although I can do this by ear for simpler songs, this is quicker and easier. It also has something called "RealDrums" which uses sampled drum performances in place of MIDI-generated drums for playback. This is nice but less essential since I normally import the MIDI into SONAR 3 if I'm going to record with the track, and there I usually replace MIDI drums with sampled drums. But it's cool to have the track sound more realistic right in BIAB. I don't usually even make new year's resolutions, let alone write about them in my blog. But this year I'm making a (sort of) retroactive resolution. I've had a copy (probably two) of Thomas Pynchon's novel Gravity's Rainbow since maybe 1975 (it was published in 1973). GR is considered to be one of the greatest novels of modern times, and it even (somewhat) concerns rocketry and World War II history, two strong interests of mine. I can't say what it's really about since I've never read it. I have tried to read it at least three or four times. It is a mountain of a book, and helpful Amazon spotlight reviewers even provide advice for first time readers seeking to get through it (apparently I'm not alone in having trouble with this). But I'm not taking that advice. I'm giving up and resigning myself to the fact that I will never read Gravity's Rainbow. That's the retroactive part of my resolution, which I have successfully kept by not reading this book for some 32 years. I'm extending the resolution by also giving up the idea that I should or might or even really want to read it, and I'm giving up the vague, tiny, nagging guilt I carry for not reading this great book that has been on my list for so long. And I'm extending it further to include Pynchon's 784 page Mason & Dixon (bargain table book that just went into the basement), as well as Will and Ariel Durant's 11-volume Story of Civilization and all of the Great Books of the Western World that I traded an excellent Martin classical guitar for back around 1982 (big mistake). Letting go of guilt - easier said than done, I know. I buy a lot of books, and I read a lot of what I buy, including some monster books, like Neal Stephenson's 928 page Cryptonomicon (I love that book). But I've decided that it's OK not to read some books, even if I bought them and had them on a list forever, and even if they are universally acclaimed. I feel better. Now if I could only exercise more and lose weight retroactively, I'd be all set.